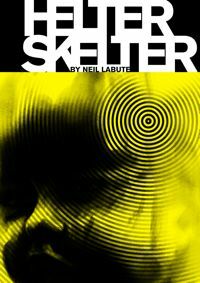 The first thing to note about Helter Skelter is that normally the play is shown with another one of LaBute’s plays – which may or may not be a good thing. 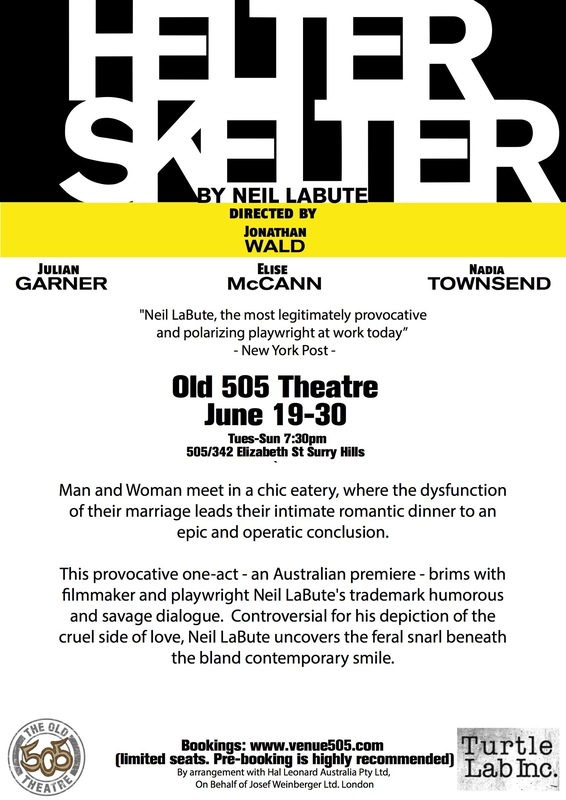 Helter Skelter is currently having its Australian premiere at the Old 505 theatre, shown without The Furies or Land of the Dead. Having never seen Helter Skelter performed any other way, I am glad I had the experience of seeing it alone – and with the addition of the goat. 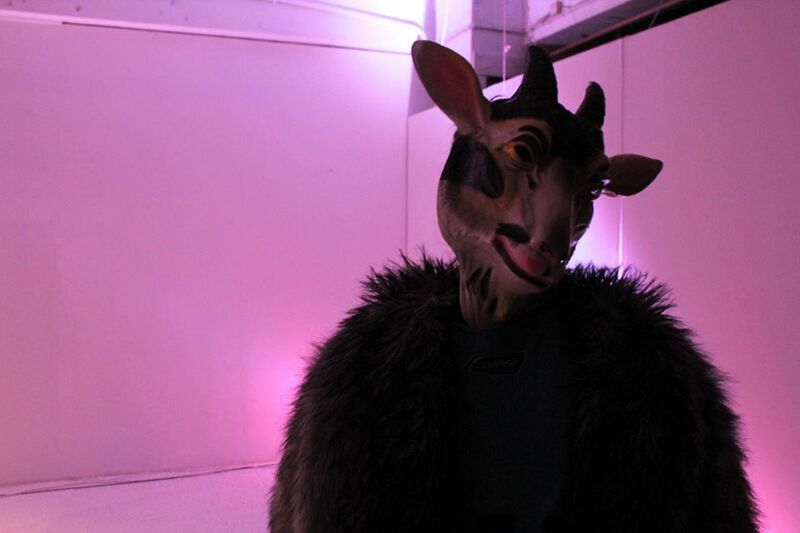 “Tragedy” comes from the Greek for “goat song” and so in Jonathan Wald’s excellent interpretation of LaBute’s play, we have a singing goat. Our goat is the sublime voice of jazz singer Jo Fabro who spends the length of the play with her back to us made up to be her front. 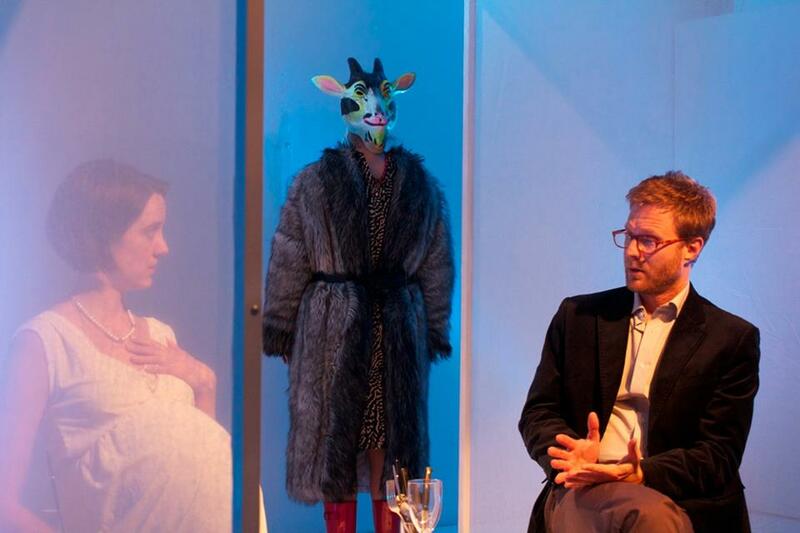 The addition of the goat, besides its softening of the misanthropic nature of LaButes words, swings the plays tragic focus front and centre, creating space between naturalism and a more representational nature of LaBute’s dramatic dialogue. The addition of a surreal setting that almost makes the couple look like they are made of sugar and planted on the top of a wedding cake increases this sense of the abstract. The play comes alive under this change in direction, giving LaBute a much-needed boost into a philosophical setting. Helter Skelter was only published in 2008, but LaButes intelligent and harsh look at human nature can seem a little like a reach for some old-world-objectivism, while his point remains relevant. He is an adept at revealing the dark side of human nature, but there is a big gap between now and 1989 when he first started, and chronic realism was a la mode. If his methods can seem a little dated, his grasp of dialogue isn’t. Nor his ability to recognise the unsayable in suburban culture. Jonathan Wald ( in collaboration with Nadia Townsend) have given Helter Skelter an exciting edge with their changes and additions, so the beauty of the play moves to the fore. Add to this spot on acting by Nadia Townsend as “woman” and Julian Garner as “man” and you have an unforgettable experience of the play. I doubt that I could see it performed better. Crucial to the play, but difficult to discern, is the relationship between the narrative and the Sharon Tate murder. The woman, dressed in white, close to very sharp knives and obviously eight months pregnant can only be one person standing under the banner that says Helter Skelter. The play’s dialogue contains a brief reference to the Manson murders, but outside of that it is difficult to understand the connection. It’s the wife’s cool eye upon her squirming husband and her universe crushing moment of the awareness of his absolute pathos, that remind us more of the Armageddon Manson was predicting with Helter Skelter. What if Armageddon is that moment for each of us, when our sins come home to roost, the judgement not poured out by an observing god, but by the ones we love that we have betrayed? The Manson reference, deliberately relegated to the background, while being in the foreground also, herald the advent of an extreme act that is the antidote to the sanitized life that is the woman’s lament in Helter Skelter. 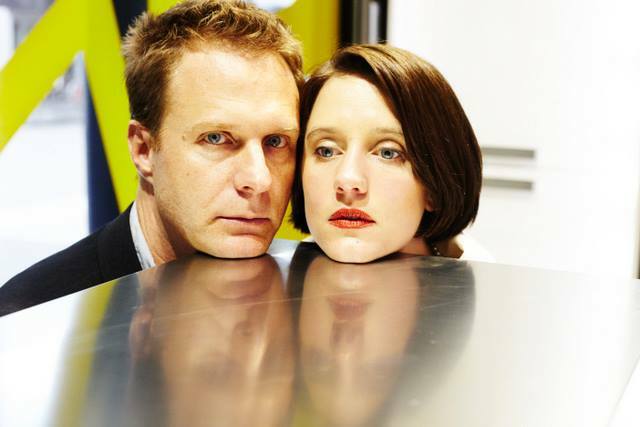 And it is Nadia Townsend’s woman who will deliver the potency of the play, as Julian Garner’s man, not completely aware of the depth of the tragedy he has caused, fusses and blusters opposite her. Both actors are perfectly in tune with one another, their thinly veiled sweetness when they meet through to his pathetic speeches trying to make his indiscretion into something “positive”. LaBute places every proper answer in the mouth of Townsend, as she reminds her straying husband that the time for calm rational clarity of thought was when he was in the arms of his lover, and the time to think of their children and the unborn child she carries was then also. The narrative explains to him that he has set events in motion that cannot be undone. There is nothing he can do to calm and still the waters away form any consequence he feels. He must lie in the bed that he made, and she will see to it that it is quite a bed indeed. If the Greek tragedy to which LaBute is so deeply connected relayed mythology, LaBute moves tragedy into the day-to-day suburban horrors of our repetitive behavior. Chilling is the woman’s clarity and rationality, but unfathomable is the man’s voluntary unconsciousness, his willingness to be dragged along by whatever feeling presents itself, and his complete refusal to take a firm grasp of life. It is this knowledge that crumbles her world, when she realizes she can’t communicate with a person who insists on living his life with so little awareness. Her final tragic act is an action related to speechlessness and the loss of words. The fact that LaBute frames this horror in a trendy restaurant, surrounded by people who never interact is telling. No waiter will come to take orders, no other human will make their presence felt. We only know they exist because the man is embarrassed by the public display. This is the ‘them’ reflected in the facade of their marriage and its sole existence as to be seen from outside. Helter Skelter is a play worth seeing and the performance currently on at the old 505 by Turtle Lab is an opportunity to see this play at its very best. 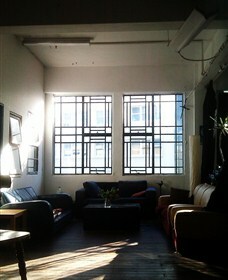 You can buy your tickets here. Helter Skelter is playing until June 30.